A small head with huge power, while the cabinet boasts plenty of deep, low-end response, perfect for 5-string players. Get ready for explosive bass tone. 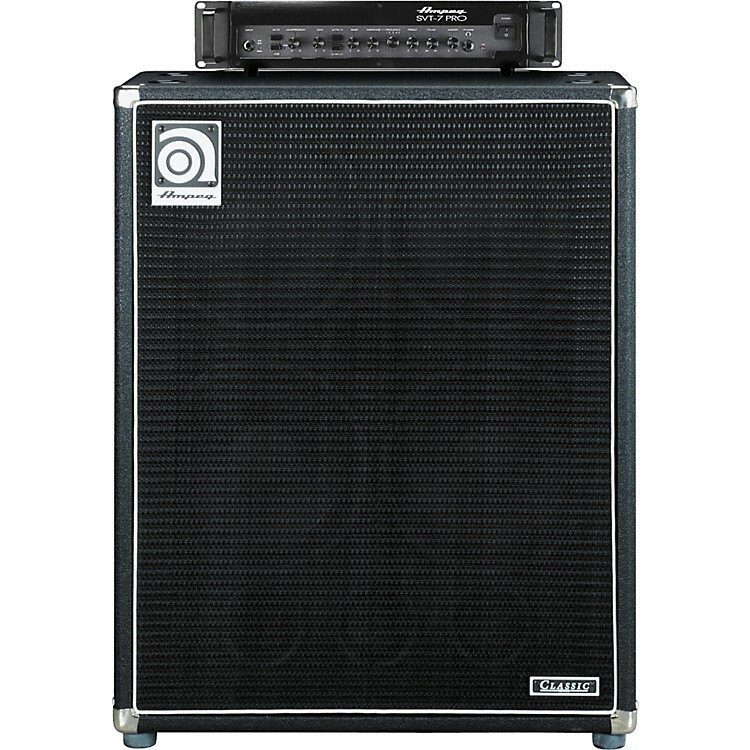 This amplifier package features SVT-7PRO Amp Head and SVT-410HLF bass speaker cabinet stack”two of Ampeg's celebrated head and cabinet, offering solid construction, immense power, and that distinct Ampeg tone. The SVT-7PRO pumps out a ferocious kilowatt of pure Ampeg tone in a compact design that weighs in at just 15 pounds. The SVT-7PRO features the same professional features as Ampeg's other PRO Series amp heads including a flexible 5-position mid tone control, remote switching FX loop and a sleek onboard variable compressor. The tube preamp boasts a premium JJ 12AX7 that feeds the weight-defying Class-D power section. It's portable and small but can power everything from a small single PN-115HLF up to a monster Heritage SVT-810E. The Ampeg SVT-410HLF speaker enclosure give you plenty of volume and clean low end. This 4x10" speaker cabinet has the same speakers and 1" horn as the SVT-410HE with 2" coils and 30 oz. magnets, but the cabinet itself is tuned differently. The bass cab is deeper and has a bottom port that results in better low-end response, down to 28Hz. There's a reason Ampeg is a household name when it comes to bass tone. Order today and find out what you've been missing.